President Barack Obama’s foreign policy approval rating continues to drop as the conflict between Russia and Ukraine remains unresolved, CBS News reports. 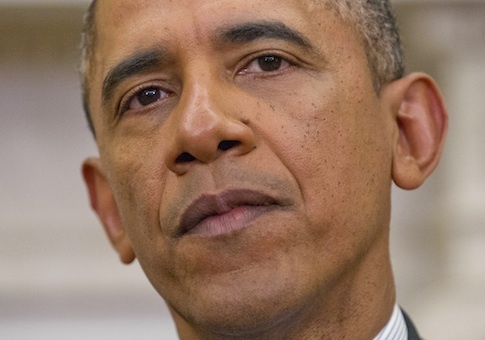 Just 36 percent of Americans polled approve of Obama’s foreign policy overall. This compares to the 39 percent approval rating he received just last month. Forty-six percent of those polled disapprove of how Obama is handling the situation between Russia and Ukraine. Thirty-eight percent approve. The poll found that 56 percent of Americans support U.S. sanctions against Russia. The CBS poll also found that 43 percent of Americans believe the U.S. image has grown worse in the world since Obama became president. Thirty-two percent believe the U.S. image has improved. This compares to a 2009 poll that found 60 percent saying the U.S. image had improved worldwide. This entry was posted in National Security and tagged Barack Obama, Russia, Ukraine. Bookmark the permalink.